"I envision an America that returns to its Constitutional roots. An America which eschews spread-the-wealth talk and instead emphasizes personal responsibility. I see an America that takes care of those who truly are unable to take care of themselves, but insists that the able bodied be self reliant, rather than ruminating on what their government can do for them. I envision an America with a Federal government scaled down to its Constitutional boundaries, not interfering with the lives of its people, but providing for the common defense of its citizens, including those in the womb. I envision an America far from the current disaster created by the Demopublican party and their cronies and contributors from Wall Street. I see an America where racism has been dealt a mortal wound with no hope of recovery. I long for an America where all lame excuses for dependence on the government have passed away. I hope for an America where the schools are controlled locally, insulated from federal mandates. I dream of an America where the government spends no more than its income, where pork barrels are shattered and earmarks are not tolerated. I cry out for an America that has shed the false responsibility of policing the world, instead defending its own borders while warmly welcoming guest workers and legal immigrants who carry their fair share of the burden of taxation in return for sharing the benefits of this great nation. I envision an America where people love their President, pray for him daily, and oppose him or her when their philosophies and policies inflate the power and role of government at the expense of the freedom of its citizenry. I hope for an America that will reward entrepreneurs and those who create jobs instead of punishing them with incentive-suppressing tax policies. I pray for an America where politicians can be trusted and an America that realizes its greatness comes from its people, not from its government. President-Elect Obama, my vision may differ from yours, but you will have my prayers during your tenure. Congratulations on your historic victory, and may God bless America and you!" Why don't you go share your vision too, and then cut and paste it into the comments below? If I get a response from the Obama team on my vision, I'll post it in a future entry. And a quote from Winston Churchill - The inherent vice of capitalism is the unequal sharing of the blessings. The inherent blessing of socialism is the equal sharing of misery. Thanks to Ben Bennett at 29e for the point to this OpEd piece in the New York Times by Warren Buffett. Buffett is moving his private funds gradually into 100% US stocks. Why? "A simple rule dictates my buying: Be fearful when others are greedy, and be greedy when others are fearful." So we've got 700 billion dollars going to bailout the institutions who, along with their willing accomplices in Congress, are largely responsible for the current financial catastrophe. Unless you are one of those 40% of residents in the US who pay no federal income taxes, you might have some interest in how your taxes (and ultimately those of your great grandchildren) are being disbursed. Mark Cuban over at Blog Maverick has given us a point to Bailout Sleuth, a site tracking the Treasury Department's execution of the bailout. And, while I know this might stun you, the first documents released relating to the Treasury Department's contract with the Bank of New York Mellon Corp. - well, they actually blacked out the compensation amounts and terms. Since we're just taxpayers, maybe we don't need to know such details. You can click the images on this post to see a larger version of these "censored" documents. You may want to download them and send them to your Congressman and Senators and ask them if a shroud of secrecy between the Treasury Department and these financial institutions is what they had in mind when they handed over $700 billion of our money? The Treasury Department's financial rescue bill suffered loss in part due to bad branding. I mean, who among us wants to actually fund a "bailout"? If only they had called it a "work-out," like the banks do on their own bad loans, then maybe it wouldn't have seemed like such a bad idea. Not much of the bill would need to have been changed, but once it was dubbed a bailout, it was doomed. Especially during an election season. Congress is taking a couple of days off, probably to cover their short positions before someone introduces a Workout Bill. ...unless it's your own blood, of course. The quote "buy when blood is running in the streets" is attributed to Baron Rothschild as his advice to accumulating great wealth. Today the Dow dropped 504 points, Merrill Lynch is being rescued by Bank of America, Lehman Brothers files Chapter 11, AIG is on the brink, and General Motors recently traded under $10 per share. I'm not sure how deep the blood has to run, but this could either be an historic opportunity, or the beginning of the end. I'm guessing opportunity. Don't mortgage the home and dump it into mutual funds, but don't be too scared by all the storms in the Gulf and on Wall Street. Tomorrows big stories are germinating in obscurity today. Perhaps you are one of the central characters? 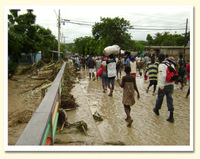 I've just read a first-hand report on the tragic aftermath of the multiple storms that have hit Haiti. I know there has also been a lot of destruction along the Gulf Coast as I follow the relief efforts there through friends in Baton Rouge. Our company, LightQuest Media, represents Love a Child Ministries and their founders Bobby and Sherry Burnette who are full-time missionaries in Haiti. Sherry has been keeping a journal and if you have the stomach for it, you can see some glimpses of the terrible toll the storms are extracting from the Haitian people by reading her latest entry, Hurricane Ike's Deadly Blow to Haiti. If you have any desire to help the Haitian relief effort, you can donate by going here. My suggestion for helping the people of Baton Rouge would be HPC. I’m still waiting to hear if we are officially in a recession. In a strange way, I hope so. For one thing, it would be a shame for so many to endure the financial malaise of the last year or so without some official label to validate the experience. But, one of the truths about recessions is that many opportunities are born in the midst of economic darkness. I’ve found over the years that it usually pays to be optimistic, especially when things appear really crappy. In the early 80’s there was much doom and gloom being purveyed by gold bugs like Howard Ruff. He was right about some things, but the economy boomed and gold tanked. Many conservatives were sure that the election of Bill Clinton would spawn an economic Armageddon, but the economy surged forward. Then there was the rapid rupturing of the dot-com bubble in 2001-02, followed by yet another recovery, even if more tepid than the 90’s. My point is this – it seems that every time the economic forecasts range from dour to dismal, smart leaders are preparing for the next boom. Preparation may entail some pruning, but while you are wielding the shears be sure to keep your senses probing for an obscure opportunity. Tomorrow’s success stories are often conceived in the thick of difficult days.